Bakit Ang Sarap ng Ice Scramble? It’s going to be summer soon. Actually it’s already summer, but it’s still raining… so I’m saying it’s going to summer soon. Hehe. But anyway, one of the best ways to beat the summer heat is by drinking the Pinoy Ice Scramble! I don’t know why he asked that because he was not having ice scramble during that time. Well, maybe he had it a few minutes ago before I saw him and his friend. Nyok! I would have wanted to answer his question but I did not know him and he might find it weird if I suddenly talked to him. So I’m answering that question here. Hehe. Well if you love milk, I believe you will love Ice Scramble too! Because it’s basically evaporated milk with some banana flavoring mixed with sugar and shaved ice. Plus, you can put a lot of toppings on it. Anything you want like marshmallows, candy sprinkles and others. But if you want the classic Pinoy Ice Scramble that first became popular in the 80?s. Then just put powdered milk and chocolate syrup on top. Yummy! And that’s why Ice Scramble is delicious! And just in case you want to make your own version at home, you can check out this article: How To Make Ice Scramble. You’ll discover there why Ice Scramble is colored pink! Go ahead and read it. Nyok! This entry was posted by Fitz Villafuerte, who has written 13 posts as fitz, on Tuesday, March 22nd, 2011 at 2:30 pm and was filed under Beverages, Desserts. there are a lot of stands that sell these in the mall =) its a different version of milk shake hehehe! sarap naman nyan nakaka-miss mga pagkaing pinoy.. I remember you talked about this post in particular during iBlog7! Awesome job on both posts! Wow san yang tindahan na yan? Ang linis ng pagserve ng scramble.. I first tasted scrambled when I was in Grade 2 and I fell in love with it ever since. Great Images! yay! ice scramble, fav ko to… yummylicious! oi dami kaya ice scramble dito sa Cebu. 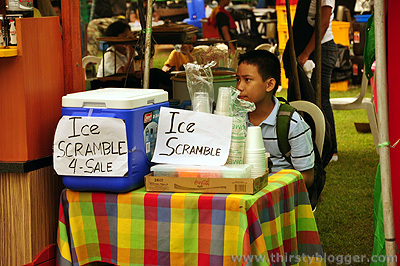 when I was an elementary student, after lunch break ako mag i-ice scramble.